HP is most the prolific contributor to TPC-H benchmarks, allowing us to compare systems from generation to another, and between processor architecture, and the scale-up characteristics. 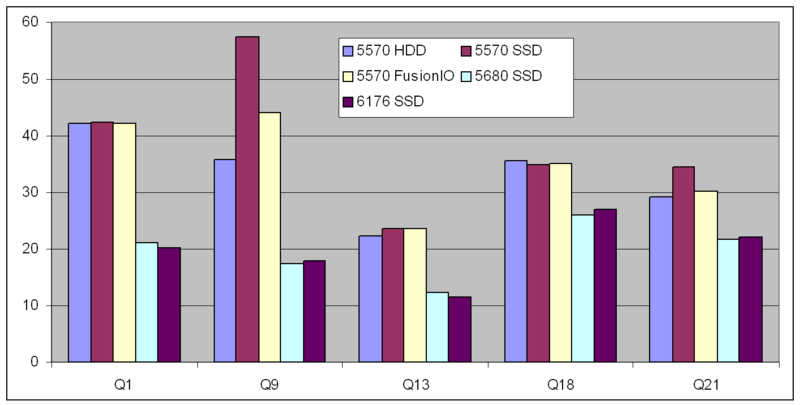 Below is comparison of TPC-H 100GB results for the ProLiant DL380 G6 with 2 quad-core Xeon 5570, the DL380 G7 with 2 six-core Xeon 5680 and the DL385 G7 with 2 12-core Opteron 6176 processors. Overall, the Westmere system is 42% better in the Power test than Nehalem, and slightly better than the 12-core Magny-Cours. Below are the system details. Ideally, we would like to compare for differences in just one substantial component at a time. But we must work with the results that are available. The difference in processors is both the 50% increase in the number of cores and the 13.6% increase in frequency. There are also differences in memory, from 144GB to 192GB, and in the Windows operating system and SQL Server version from 2008 sp1 to R2. The max server memory settings were 138,000MB and 190,000MB respectively. The TPC-H SF100GB database (with SQL Server 2008 date data type) data and indexes is just over 140,000MB. It appears that neither report enabled page compression. The expectation is that there is more disk activity in the Nehalem system with 144GB memory. The affect of the difference in memory is expected to be highly uneven. Some queries will not be affected by the difference in memory, others will be affected even with SSD storage. 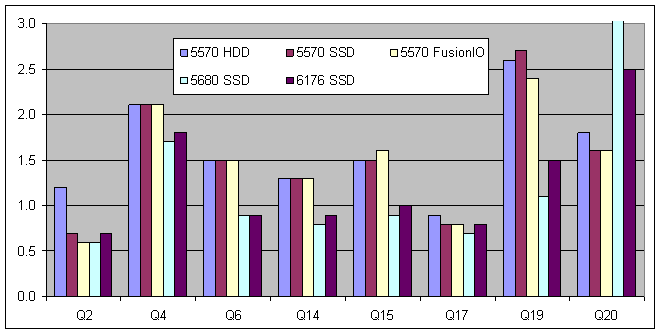 Windows Server 2008 R2 made significant improvements in high-end scaling, typically the realm of 32_ cores, through the removal of certain critical locks. This still might contribute in a small way at 8-12 cores. 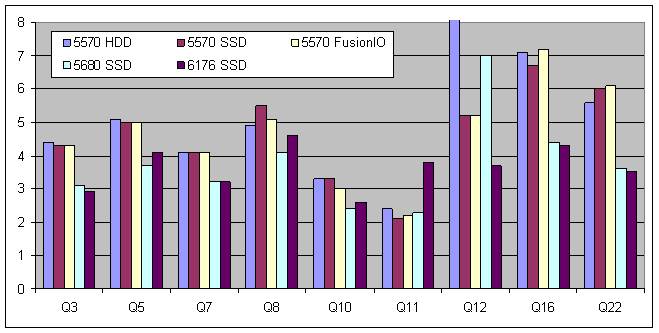 SQL Server 2008 R2 may also contribute some differences. If an execution plan were different for any query, the results may be uneven. Unfortunately, the TPC-H full disclosure reports do not include the execution plans. The TPC-H Power individual query runtime ratios are shown below for Westmere relative to Nehalem. Most of the queries ranges from 20-50% faster for Westmere over Nehalem, plus memory and OS/SQL version, in-line with the overall average of 30% (1 over 1.42). Query 9 is 3 times faster, and Query 20 is 2.3 times slower. It would be interesting to see if there are differences in the execution plans. The TPC-H Power individual query runtime ratios are shown below for Magny-Cours relative to Westmere. Most of the queries are about the same. Magny-Cours is slower in query 11 and 19, and faster in 12 and 20.